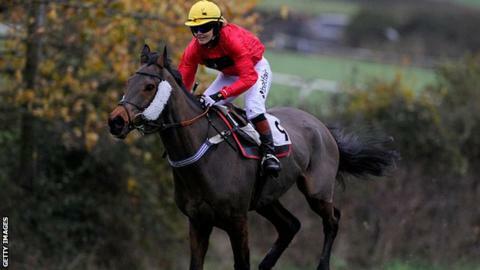 Victoria Pendleton is a "great advert" for racing, says the owner of the horse she hopes to ride in the Foxhunter Chase at the Cheltenham Festival. The Olympic cycling champion, 35, has been criticised by some ex-jockeys, who feel she is putting herself in danger. She was unseated from favourite Pacha Du Polder at Fakenham on her National Hunt Rules debut on 19 February. But Andy Stewart, who owns Pacha Du Polder, said: "I fully endorse Victoria and what she's trying to achieve." The unseating at Fakenham followed another fall in the novice riders' point-to-point event at Barbury Castle on 14 February. Pendleton only had her first riding lesson a year ago. Writing in her column for betting exchange Betfair on Monday, Pendleton said: "It's hard to believe that just over a year ago - 22 February 2015 to be exact - was the first time I sat on a horse, and now I'm two days away from my second Hunter Chase. "There have been a few knocks and setbacks along the way and of course there was the fall at Fakenham last week. But being totally honest and realistic, I would be surprised if such setbacks didn't come with a challenge of this magnitude. "I love learning and improving, which is something I really missed when I finished cycling and that's exactly why I've been bitten by the horse racing bug." Former champion jump jockey John Francome has said Pendleton "wants saving from herself" and is "an accident waiting to happen". But Stewart added: "The manner in which she has conducted herself throughout has been exemplary. "The challenge allied with her positive approach has been a great advert for racing and her involvement has led to widespread coverage of the sport far beyond the racing pages." A decision on Pendleton's participation at Cheltenham will be made after she rides Pacha Du Polder at Wincanton on Wednesday.